Billy Graham’s mission has always been to spread the Gospel in every effective means possible. Once he dipped his toes into the broadcast world, he couldn’t turn back. He began reaching millions through radio. So, how did he go from local to national to satellite radio? One day, a man named Torrey Johnson called Graham and asked him to take over his 45-minute radio program. It would cost $150 a week for the radio time on WCFL in Chicago. “Little did I realize that it was one of the turning points in my life,” said Graham. Graham took the request to the deacons of church he pastored, and after the financial needs were provided, they agreed to the offer. He wanted there to be a marquee name on the program, so he invited George Beverly Shea, a bass baritone and a staff announcer at the Moody Bible Institute’s station, WMBI. Shea, after much discussion, finally said he would be part of the program. 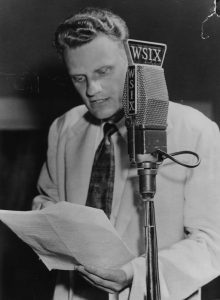 Billy Graham’s first radio show was doing so well that WMBI signed he and his team up to broadcast their regular Sunday morning service from the church during March and April of 1944. A few years later in 1950, Billy was speaking at a conference in Michigan. Two men walked up to him and introduced themselves as Fred Dienert and Walter Bennett. They tried to interest him in a national radio program. At that point in time, he was much too busy to be interested in such a thing. He thought there was no way that would happen, but God had answered prayer. They took the step of faith and signed a contract to air The Hour of Decision. The crew, Billy Graham, Cliff Barrows, and Grady Wilson, didn’t know what to do with the $25,000. They didn’t have a separate corporation bank account or even a board of directors. That’s how the Billy Graham Evangelistic Association (BGEA) was founded. Billy called his business manager at Northwestern School, who filed documents establishing the BGEA. They sure worked. The Hour of Decision aired for 60 years, turning into The Hour of Decision Online with the advancements in technology. Continuing to use every means possible to share the good news of the Gospel, the BGEA’s audio team began developing more and more ways to be heard. They began producing radio spots for advertising, and now publish a number of online and broadcast programs such as GPS: God. People. Stories. and Decision Minute. Most recently, the BGEA has partnered with SiriusXM to have their own channel on satellite radio. “The Billy Graham Channel” is a limited-run channel ending on Nov. 26, 2017, that features Graham’s sermons and personal reflections from family, friends, and U.S. presidents. Great article. Im upset I only discovered Mr. Grahams sermons with this satellite channel. How does one get involved with the BGEA? I would love to be a part of it in some fashion. Please Lord, send someone to pick up the torch he has carried for Your Kingdom for all these years. I know Ruth has been waiting for him a long time and she and our King, Cliff and Bev Shea and all the heavenly hosts will welcome him home with arms wide open. I am thoroughly enjoying listening to The Billy Graham Channel. No matter what year the sermon is from, the issues Dr. Graham touches on are relevant today. God bless you Dr. Graham and God bless the BGEA. I’ve been listening info to the broadcasts on Sirius XM and they’ve amazing. I would hope that in the same spirit of embracing new technology and new frontiers, the BGEA would embark on a long term arrangement with Satellite Radio. I love Billy Graham sermons ! Remember as a kid my mom and dad never missed one ! I’ve recently found Jeseus Christ ! Please bring back Billy Graham radio ch 145 ! FULL TIME !!! This country and the world need it ! Please ! I have so enjoyed listening to Billy Graham on Sirius XM channel 145. He is such a wonderful pastor to listen to and hear the words of God being spoken through him. I remember listening to him as a small child when my grandmother would have him on and that is where my tiny seed of faith was planted in my life. He not only makes me feel closer to God, but also my grandmother even though she has been gone for so many years. She showed me God through his ministry way back then & now that I am much older I am so thankful & humbled by that experience. 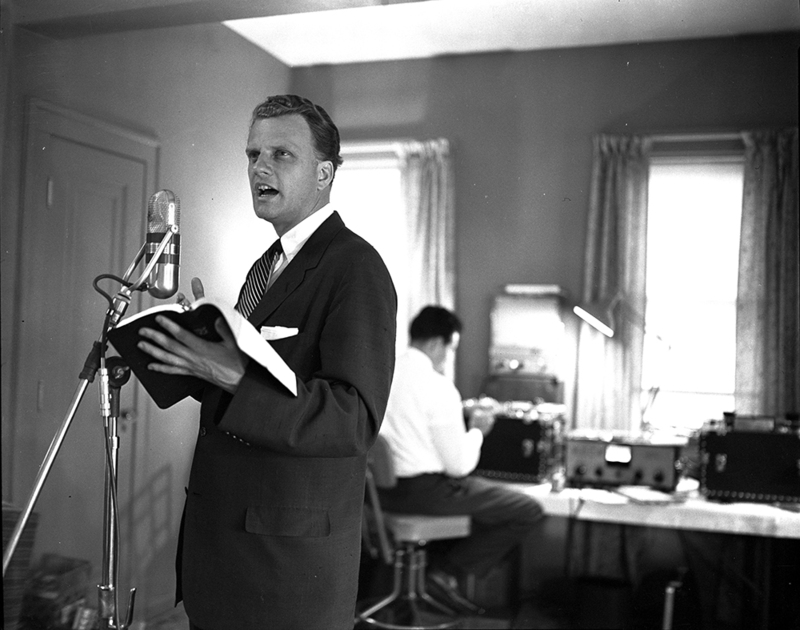 Thank you Mr. Graham for devoting your life to show the world our Dear Heavenly Father & what a wonderful gift that is. Walter Bennett built a house on Lake Maxinkuckee at Culver, IN. My in-laws bought that house in 1986 and our large family of 25 enjoyed it for many years. In the basement were shallow cabinets with all kinds of phone switching equipment where Mr. Bennett worked when he was in town. 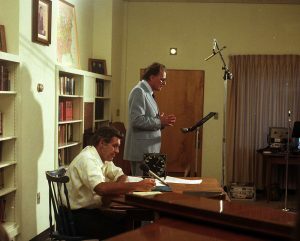 In the living room was a large two-deck organ and I often wondered if it was given to Mr. Bennett by Bev Shea. When it was time to sell the house, the organ was donated to a church nearby. Sadly, the house was on the market for years and even updated, but eventually scraped to make way for two smaller homes. But I was pretty thrilled to know that we had many wonderful family memories of the place built by the man who helped put Billy Graham on the airwaves. How can I get Billy Grahams crusades on my AM or FM radio? I have thoroughly enjoyed listening to Reverend Billy Graham preach on SiriusXM. I was thinking about cancelling it until I now can listen to the Billy Graham channel or the Southern Gospel Enlighten station. I have always held the upmost respect for Reverend Billy Graham. God bless his family taking his message to the next generation.